Oradour-sur-Glane was the site of one of France’s worst war-time atrocities, when hundreds of villagers were shot and/or burned alive before the village itself was torched by Nazi forces towards the end of the conflict. 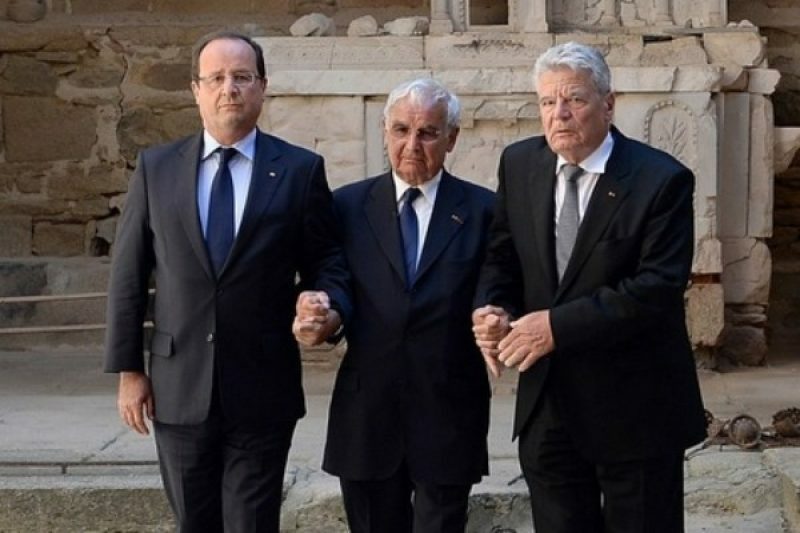 As a symbol of the fraternity between France and Germany, President Gauck (pictured on right above) made an emotional visit to scene of the multiple murders, along with President Hollande and 88-year-old Robert Hébras (centre). Hébras, who was 18 years old at the time, was one of only six survivors of the massacre. He escaped death by hiding beneath the bodies of murdered Oradour citizens. The visit of Federal President Gauck is the first of a German head of state since the mass murder. As such, it marks an important point in Franco-German relations and reconciliation. The image of François Hollande and Joachim Gauck echo those of President Mitterand and Chancellor Helmut Kohl from 1984, when they walked hand in hand at Verdun in memory of the victims of the First World War. “This will be a symbol; the symbol of a history, of a past that looks itself square in the face, of a truth that must be told, pronounce, proclaimed, recognised once again in the presence of the families but also in the presence of the survivors,” declared François Hollande during a press conference at the Elysée Palace on Tuesday. At his sides, Joachim Gauck said that he had accepted this invitation to meet witnesses and their descendants of this dark event with a “mixture of recognition and humility”. “I won’t hide my feelings from them but I won’t hesitate, in full political conscience, to say to them that this Germany that I have the honour to represent is a completely different Germany from that which haunts their memories,” said President Gauck. In Oradour, the two presidents will go to the Catholic church where women and children were burned alive. Most of the men were rounded up and shot. A total of 642 people were murdered in the massacre, including 205 children. The entire event was organised in the context of the 50th anniversary of the Elysée Treaty. The visit to the memorial site at Oradour will be the main focal point of the visit of the German Federal president, who has been in office since 2012. Along with Robert Hébras, the only other survivor of the Oradour atrocity is Jean-Marcel Darthout. The event was a painful one in French history that still has many unclosed wounds. During a judicial process that lasted from 1953 to 1983, French nationals from Alsace who served in the Wehrmacht found themselves on the accused bench alongside German citizens. The process was re-started again in 2010, when legal action was instigated in Dortmund against seven surviving former SS men based on documentary evidence taken from GDR files that had been kept secret during the Stalinist era.